Do you gave a favourite saint? Perhaps your patron has special interests? This month I have a look at the saints and why we like them. My column is published this weekend in the Scottish Catholic Observer. Get your copy before they run out. If you are too late the full text will be here next week. My June Column – Who’s Standing on Your Shoulder? The recent General Election produced some surprising results. The government hoped for a large increase in its majority but expectations were not met and the majority was lost. How could this happen? What caused the voters to cast their votes in the way they did? I was one of those who reasoned that I should cast my vote for one party but decided in the end to stick with my normal voting pattern. What influenced me to make that decision? I would like to think that I thought it through and came to a logical decision but I suspect that my eventual vote was the result of emotion. I wasn’t able to desert the party I had always supported. This has made me think about what influences our behaviour. Whether we are truly logical beings or respond to our feelings we experience influences from everything around us. I started to think about the possible influences on my behaviour. Which of the many influences is steering my thoughts? An obvious influence on me is my family and upbringing. As a child I absorbed values and opinions from parents and relatives. These must be imprinted on my brain, even if I have moved on, determined to think for myself. That’s not to say that I’ve been programmed to copy my parent’s behaviour. Perhaps I’ve been moved to rebel against their views and act in a completely different way. Whether I’m moved to copy or oppose their thinking I’m still influenced, one way or the other. Television has been accused of being a bad influence on children. Other commentators would disagree and point out how our views on third world poverty have been influenced by images of starving children broadcast on our screens. I think there is little doubt that television is an influence on our attitudes. It has been suggested that because the television set is in our home we are more susceptible to its influence that we would be to an outside source. Television is accepted as a trusted family member. I don’t know how much I’m influenced by television since I find so much of it unwatchable but I’m sure there are subtle influences in the things I do watch. Recognising the influences and thinking about the attitudes they convey is a first step to maintaining some truly independent thought. Radio might be a more insidious influence. It tends to be on in the background while driving or working in the kitchen. I’m not sure how much we are influenced by music on the radio. Some have described rock and roll as the music of the Devil and blamed the rebellious behaviour of teenagers on its influence. That may or not be true but I don’t find it a problem on Classic FM. Talk radio is a different beast. Opinions are filtered out to us – sometimes dressed up as news. Experts can make reasonable sounding cases for all sorts of nonsense but we may be more likely to accept it if we hear it on radio than if we hear it in the pub. Celebrities seem to be the great purveyors of opinion today. So important are they that charities and political parties often use them to put over their message. Why should celebrities be influential? This has always been a puzzle to me. Apparently celebrities should be listened to because they are famous. Some are actors or people in the media. Because they are in the public eye their opinions are valued. Some celebrities seem to be famous for being famous. They don’t seem to actually do anything. That’s something I just fail to understand. Newspapers and books are thought to be influential. The recent election results seem to contradict the idea of newspapers being crucial to election success. Perhaps they have overdone it. Surely you can get to a point where the public can recognise nonsense when the lies are so blatant? Newspapers are transient. We read them today and they go in the recycling bin (did you notice my green credentials there?). Books, on the other hand, hang around. I was once asked what book had influenced me most. I found that one very difficult to answer. I think everything you read has an influence on you, even the back of the cornflake packet. Having given that question more thought I would have come to the conclusion that the Bible must be the book that has influenced, not just me, but the western world. You might never have opened a Bible but still have experienced the influence of its contents. Over the centuries the teaching contained in that book has produced societies that increasingly hold ordinary people to be valuable. Much of western law is Bible based although recent developments in abortion and euthanasia seem to have moved against that trend. Every time we go to Mass we hear the word of God proclaimed in the Bible. The great religious feasts of Christmas and Easter that mark out our year are straight from the Bible. How many blockbuster films can you remember that are straight off the pages of the Bible? The great promise of the Bible that the chosen one will come as our saviour has permeated through literature and still forms the basis of Hollywood’s output. Think of the great movie heroes, Superman, James Bond, John McClean in Diehard. Each is the one person come to save us. Superman is sent by his father to Earth. He, the son, has supernatural powers and uses them to save mankind. The heroes all suffer for us. James bond even dies and comes back again in ‘You Only Live Twice’. They all come to us from somewhere else. The theme of the lone hero who comes, suffers and eventually overcomes to save us permeates much of literature. Even those who have never heard of Jesus look to a hero to lead and rescue us. Even in politics we look to a leader to be our hero and save us. Has Jeremy Corbyn come from nowhere, suffered and eventually overcome? Alas I feel that searching for our hero in politics is bound to lead to disappointment. I must own up to one of my film influences. Tom and Jerry cartoons always carry a moral message. How often have I seen Tom in a moral dilemma with a tiny angel on one shoulder and a tiny devil on the other? Each whispers advice to Tom. Tom, to the Devil’s delight, always flicks off the angel and goes the way of the other fellow. Do I experience the influence of these spiritual advisors in my life? Is there an angel, a guardian angel whispering in my ear at times of moral doubt? Is there a devil whispering in my other ear; not urging me to be bad but helping me to see the wrong thing as somehow good? How good am I at rejecting this influence? Was it Oscar Wilde who said “I can resist anything but temptation”? I need to face up to the fact that I am not totally in control of my thoughts and opinions. I am bombarded daily by influences I am not aware of. If I want to live as a Christian, following Christ’s teaching then I must be open to the whispering of that wee guardian angel on my shoulder and see the other fellow for what he is. 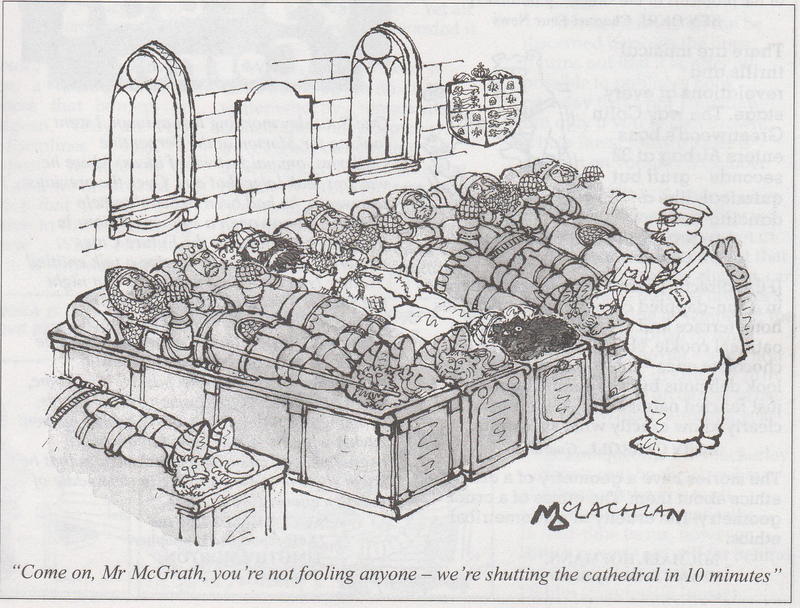 At last, after years of bad behaviour I’ve made it into the pages of Private Eye. It’s only in a cartoon but that’s still a step forward onmy road to infamy. See the cartoon below. How did they get this image?